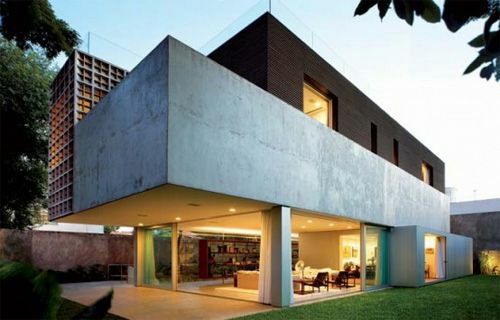 Located in Alphaville, a residential district in the outskirts of São Paulo, the Jaragua Residence spreads over 1,200 square meters and three floors. Asking for a home where the air could continuously flow, the young couple and their two children received a cozy and open home designed by architect Fernanda Marques. The spacious living, cooking, and dining spaces were left unpartitioned to ease air flow and convey a feeling of freedom. On the first floor, there are several vastly different spaces — the cozy fireplace room, high-tech media room, and bright breakfast room. Not enough? There is also a study, a cloakroom, guest toilet and help quarters. Terraces on the second-floor showcase panoramic views from the inspiring scenic landscape, a mixture of natural and urban. Focusing on creating open spaces that flow one into another, architect Fernanda Marques designed the main family area upstairs, alongside three bedroom suites — each with their own balcony. Photographed by Fernando Guerra | FG+SG, the Jaragua Residence mixes colors, textures, and art in a functional family home. You might remember Fernanda Marques’ work from this jaw-dropping home in São Paulo or this massive Malibu residence with striking indoor glass pool. We’d love to hear which you like best. Leave us a comment below or on out social media pages!